Achieve the smile you deserve. Come for the best quality teeth cleaning in Chula Vista offered by Dr. Deanna Risos today. Professional teeth cleaning, also known as dental cleaning is important because it helps in removing tartar that discolor your teeth, helping you achieve a brighter, sparkling smile. Having your teeth professionally cleaned also helps to protect your teeth from gum disease and other common dental problems. Dr. Deanna Risos offers a comprehensive teeth cleaning in Chula Vista so that you can improve your oral health and achieve your dream smile. A teeth cleaning is a painless and simple process. Dr. Deanna Risos uses patient-focused techniques to help you ease the stress and enjoy your teeth cleaning process. The first step to a teeth cleaning is the physical examination. Dr. Risos, Chula Vista best dental hygienist, will perform a thorough physical exam of your whole mouth. 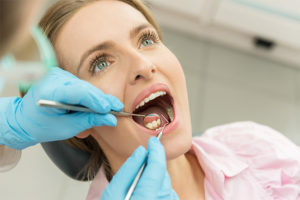 You will see her use a small mirror to examine your teeth and gums for any signs of dental problems like gingivitis and other common problems. The next step involves the use of a scaler to remove plaque and tartar that have accumulated on your teeth. It is normal to hear scraping during this process. After getting rid of all tartar on your teeth, Dr. Risos will brush your teeth with a high-powered electric brush. This process is done to get a deep clean as well as removing any tartar that might have remained after scaling. You also get a chance choose which toothpaste flavor you would like your dentist to use in polishing your teeth. Next, your teeth will go through expert flossing session. Your dental hygienist will carry out a professional flossing by getting deep in between your teeth to check for any potential dental problems. If there are cases of bleeding gums or other dental problems, you will receive an appropriate treatment. Once flossing is done, your teeth will go through a rinsing process where Dr. Risos will use a rinse that contains liquid fluoride to rinse out your mouth and get rid of any debris. Lastly, the teeth cleaning process ends with fluoride treatment. Here, you can choose what flavor you like best. A foamy gel or sticky paste is placed into a mouthpiece and fitted perfectly on your teeth for about one minute. The purpose of fluoride treatment is to protect your teeth from cavities infections after the cleaning process. Keep your teeth and gums healthy. Visit our offices for comprehensive teeth cleaning in Chula Vista. Schedule a free consultation with Dr. Deanna Risos, top rated dental hygienist in Chula Vista to for top-quality teeth cleaning and dental care. Contact us at (619)482-8880. This entry was posted in Deanna Risos, DMD. Bookmark the permalink.